That's right: the Nexus' latest warrior is a Starcraft worker unit. Heroes of the Storm takes legends from other Blizzard games and pits them against each other. The Prime Evils, the Queen of Blades, the leader of the Horde, and so on. 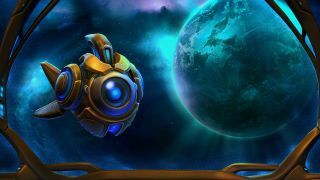 The next hero is not quite that: it’s Probius, a Protoss Probe. In StarCraft 2, the humble probe is a basic worker unit, it walks back and forth to deliver resources and warp in structures. In Heroes of the Storm, Probius is a high damage, area denial specialist, who warps in their own Protoss structures, no vespene gas required. The key to any Protoss base is Pylons, structures that, in StarCraft, power structures. For Probius, though, they’re how they regenerate mana and powers two abilities. Without a Pylon, Probius has no mana regeneration, but when near to one, they regenerate mana incredibly fast, going from nothing to full mana in about 7 seconds. With this trait, Probius spawns a Pylon at a specified location. Probes can’t ride horses, because they float. Probius, then, has a unique mount: they move 10% faster than other heroes, and can activate the ability to move 50% faster for 5 seconds. This has a 40 second cooldown, though, and if they’re interrupted during it, the effect ends instantly. This is the only ability that gives Probius any mobility: use it to escape where needed, and know when it’s unavailable so you don’t put yourself at too much risk. Disruption Pulse is a line skillshot that deals a reasonable amount of damage, and pierces through enemies. On its own, it’s plain, but interacts with Probius’ W ability, forming the main chunk of their potential in a fight. While it can be used on its own, the true focus is on using this with Warp Rift. Because the laws of time and space don’t matter to Probius, they can create Warp Rifts in lane which slow enemies. It takes a second to activate, and Probius can also cause it to explode, dealing a large amount of damage to any enemies caught within it. This ability is on a charge-based system, and two charges can be held at once (which a possible talent choice increasing this to 3). The primary defensive structure for the Protoss is the Photon Cannon, and Probius can create one inside the range of a Pylon to attack a nearby enemy. It can be used to create a defensive line that Probius can fall behind and stay safe if needs be. If Probius is able to set up a number of Pylons and Photon Cannons, they’re able to create a veritable fortress with Pylon Overcharge: it causes Pylons to gain an incredibly long range attack. Both the Pylons and Photon Cannons will shoot down any nearby enemy heroes, giving Probius strong defensive capabilities if able to set up beforehand. Null Gate doesn’t require the setup of Pylon Overcharge. With this heroic, Probius creates a vector-targeted wall (so it can be placed in any direction) that deals a small amount of damage and constantly heavily slows all enemies caught in it. The slow is huge, and helps you keep enemies where you want them. The key thing to consider with Probius is that they’re reliant on using the area around them to get the best out of their abilities. They’ll run out of mana quickly without a nearby Pylon, and so need to have one nearby to either retreat to, or near enough that it can continue replenishing their mana in the fight. Similarly, Photon Cannon is worthless without a nearby Pylon to power it, and thus is tough to use offensively without putting Probius at risk. But the most important thing to consider is how to combo Disruption Pulse, Warp Rift, and Null Gate. In a lane, Warp Rift will be avoided by enemies—the small time it needs to activate means heroes can run away or use an escape ability. When using the walls and fog of a battleground to their advantage, though, Probius can completely block off a path—either with the threat of a Warp Rift explosion or the huge slow of Null Gate, which both Probius and their team can follow up on. Depending on which heroic ability Probius takes, they will either be a strong force in defending structures with Pylon Overcharge, or will command the areas between lanes using Null Gate to hugely slow opponents. Maps like Cursed Hollow, for example, become Probius’ playground if they’re able to set up before a fight and have Null Gate. The thin pathways between lanes, where the objectives spawn, become minefields with Warp Rift, while Null Gate prevents a fast charge or retreat. Probius isn’t the carry to build a team composition around, but a hero who excels in abusing the nooks and crannies of different maps. Take advantage enemy positioning, force them to split up and become vulnerable or take a lot of damage. We can get a better glance at how exactly Probius will play out when they hit the Public Test Realm early next week, but for now, their purpose is clear: play the map. Corners, narrow pathways, and claustrophobic areas create opportunities for Probius, knowing how to abuse them, plus abuse vision limitations in your enemies will make this lowly probe a force to be reckoned with.